Well, it's almost a finished object. Just have to get some thread to sew the buttons on, since the Blue Sky Organic Cotton is too bulky to fit through the holes in the button. But that yarn sure is soft! And you can wash it in the machine (lay flat to dry). This sweater is just in time, too, since the baby was born on Friday night. She is a beautiful baby and everyone is well. The cables were more challenging in cotton (not as much give), and I'll do my next cabled item in wool, but it sure was a fun item to make. Except, of course, the finishing. It took me two knit nights to finish, though the puppy and kitten tearing around the house probably has something to do with not knitting at home as much. I really liked using the Brittany Birch Cable Needle. [N.B. I haven't purchased from worldknit.com - they were at the top of the Google results list.] I started out using a Clover plastic one, but the plastic was just too slippery with the cotton yarn. And the shape of the Brittany is just so pleasing, don't you think? 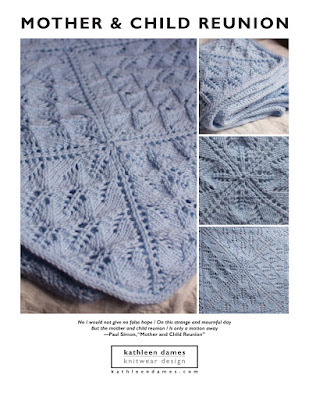 The pattern is from Knitting for Baby, which is a great book for beginners who have baby items to make. Good illustrations and explanations of techniques. And I know a number of knitters who don't have little babies around who have made the felted "diaper bag", so there is something for the non-baby crowd.